When we arrived at the Ecuador / Colombia border crossing we had no idea what to do or where to go. We must have looked like proper gringos with our South American phrase book in one hand and the Lonely Planet in the other. We joined the only queue there was and hoped for best. Fortunately it was the right queue and we managed to get our exit stamps relatively quickly. It then took literally two minutes to cross into Colombia. Well for me anyway…Sam got asked 100 questions about why he was visiting, where he was going etc…but eventually they waved him through. We did find ourselves in a familiar situation where we had no Colombian money so we changed what dollars we had left with one of the many dodgy Colombians hanging around the border and made our first stop an ATM. With no hostel booked and night travel not advised our cab driver took us to what he called an ‘Economical hotel’ which ended up being a godsend at only £10 a night and right next to the bus station. Our plan was to get up to the Caribbean coast as quickly as possible as we’d heard it’s the nicest part of Colombia. From there we were going to go to Venezuela, however after hearing how expensive it is we’ve reluctantly decided to give it a miss. This means that we will have to double back through Colombia and Ecuador to reach Peru. I’m sure some of you are wondering why we don’t just fly, but flights in South America are ridiculously expensive, so our only option is more bus travel…fun! En route to the coast we stopped in a couple of places; Popayan which is a small Colonial town, very pretty to look at but not much to do. 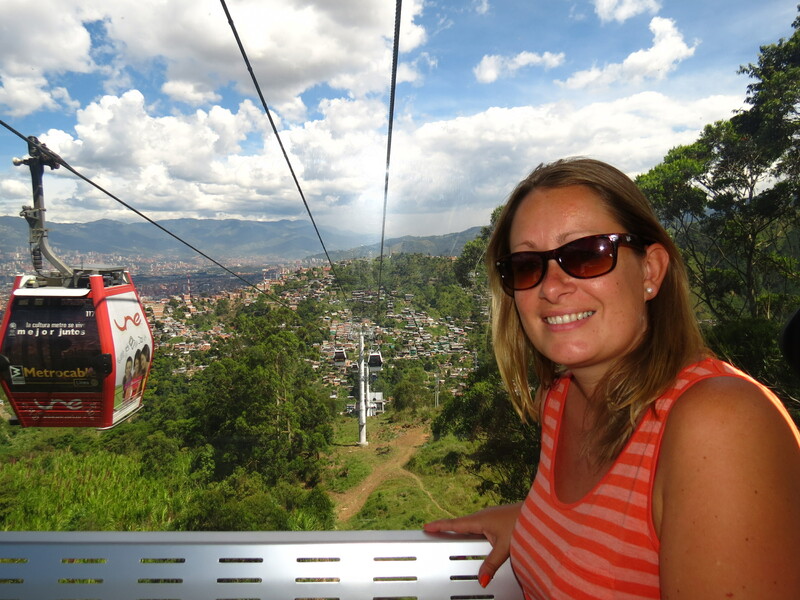 We then took a 12 hour night bus to Medellin, a large bustling city to the West of Bogota. We could have taken a Pablo Escobar tour which included trying on some of his old hats and meeting his brother (doubtful) but at £20 each we decided that we wouldn’t be missing out on that much. Instead we took the metro across town and had a walk around down-town Medellin…not that nice to be honest and weirdly full of statues of fat people. There were lots of people selling everything from a phone minutes, i.e. use their phone for so much a minute. You could also pay to get weighed on what looked like bathroom scales and there were lots of people selling home-made juices just walking around with them on trays like they were a waiter at a party. We did go on a cable car though which provided great views over the city and across the poorer areas. I also managed to get my hair cut whilst there…a real treat for me and I felt human again for a while. The last time I had it cut properly was in Laos (Jan) and Sam attempted to trim it in KL but that was a bit of a disaster to be honest. We were in Medellin mid-week so there were no wild parties or salsa nights happening unfortunately. Although I am sure the latter wasn’t a problem for Sam…I think it would take a small miracle to get Sam on the dance floor salsa dancing (watch this space). One thing that has struck us the most here is how expensive bus travel is. A typical 12 hour bus trip is about £35 each (over a day’s budget) which is why we have been trying to travel through the night…save on accommodation. This however, brings along its own risks and the stories we’ve read about armed bandits and bags being stolen have made these journeys somewhat nerve-racking. My bra has become our new wallet and Sam’s socks have become the hiding place for our passports. The buses are also freezing cold, for some unknown reason they crank up the air-con (maybe to keep the driver awake) and Sam finally got to use his sleeping bag on our last bus…after 9 months of carrying it around. My alpaca jumper and socks seem to be sufficient so far…I just need a nose warmer and I’m all set. Our latest bus journey of 14 hours brought us to the city of Cartagena on the Caribbean coast. Our first impressions…mental! As soon as we stepped off the bus and into a battered looking taxi we were faced with chaos everywhere. The lonely planet (yes we do read it sometimes) describes Cartagena as ‘a fairy tale city of romance…the most beautiful city in Colombia’. We soon realised that this was only true for a very small part of the city…the old town. Behind the ancient walls, lies the beautiful old town with any stunning squares, flower-decked balconies and boutique shops. We spent a few days in Cartagena just walking around, taking pictures and of course enjoying a mojito or two along the way. Outside of these walls was nothing but high rises, dirt and chaos. 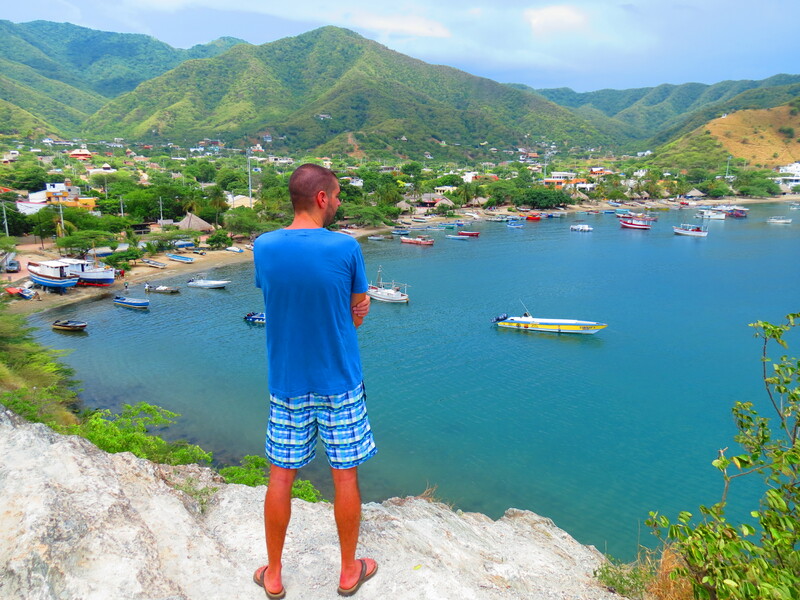 Continuing our journey along the coast, our next stop was Santa Marta where we were hoping for some nice beaches to chill out on for a few days. Not so. I think I had a certain expectation of a Caribbean coast and unfortunately so far Colombia has not lived up to it…the beaches are dirty and with a big old port stuck at one end of the beach and a sewage river through the middle, they are not very pretty. Instead we spend a few days chilling out in our hostel and enjoying the blistering heat from our roof terrace. We were back to cooking our own meals as well, so it was good to get a change from fried food. Not exactly what you want to eat when it is 36 ° outside, but you don’t really have much of a choice in South America. We quickly moved on to a small fishing village called Taganga further along the coast. We’d heard that the beaches were a bit nicer and it was also the gateway for Tayrona National Park where we plan to spend a few days before heading south to Bogota. Taganga is famous for its cheap diving so we signed up for a couple of dives as soon as we arrived…probably our last dives of the trip. It was great to be back in the water but sadly the dive sites themselves weren’t the best. Our first dive was ok but the coral reef was either dying or dead so there wasn’t a huge amount to see. 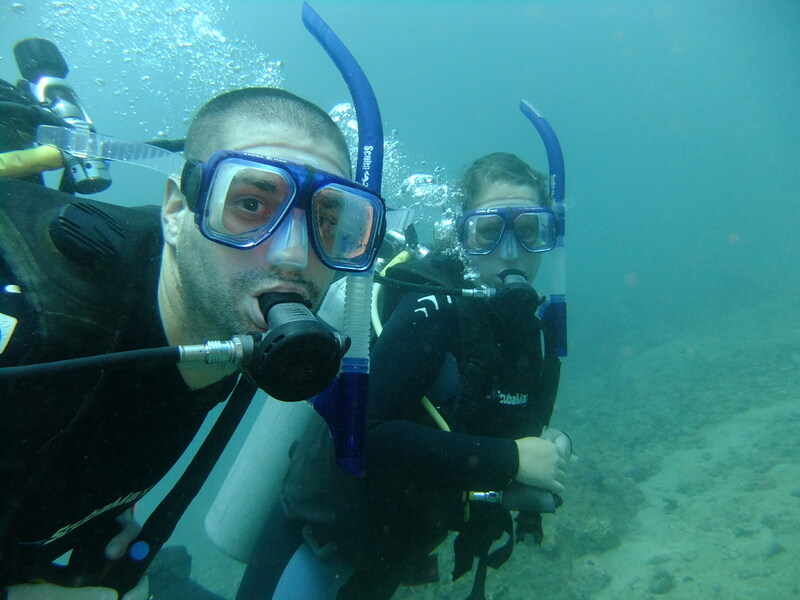 The water was freezing as well so for our second dive we both decided to wear hoods (a first for us). The second dive was more like a drift dive as the current was really strong…at one point I thought we had lost Sam so I had a mini panic and grabbed the dive master but soon realised that Sam was just above me laughing at me panicking…nice. Sam was excited to see a flying gurnard and we also got to see a giant green moray eel poking its head out of the reef wall. Another highlight for Sam was watching me (and taking photos) trying to get back in the boat…there was no ladder or step so the idea was to pull yourself up and over. Well I have zero upper body strength so our dive master had to pull me over and I landed flat on my stomach…so much for chivalry and Sam helping me. Included in our dive package were some underwater photos so we finally have a few to share with you. After a few days of hanging out in Taganga, it was time to head into Tayrona National Park. We’d heard nothing but good things about it and were told that this was where all the amazing beaches were. All we had to do was to decide which was the best way to see the park. The Lonely Planet recommends a route which involves a few hours of walking but with many beaches along the way to stop off at or stay. However, we’d met with a group of people the night before who were taking a boat to one of the remote beaches but this is all they would see but they would avoid the park fees so we were torn between the two. In the end we decided to take the books advice and go with the recommended route…even with the two hour trek. The bus dropped us off at the entrance and we spent the first hour walking through some very nice jungle with some people we’d met on the bus. We came to the beach called Arrecifes which we’d been told not to swim in as it was too dangerous. There were several cabins, camping sites and restaurants here so we stopped off for a drink before heading further into the park. The beach itself was huge…very hot sand and just a shame that we couldn’t have taken a dip. 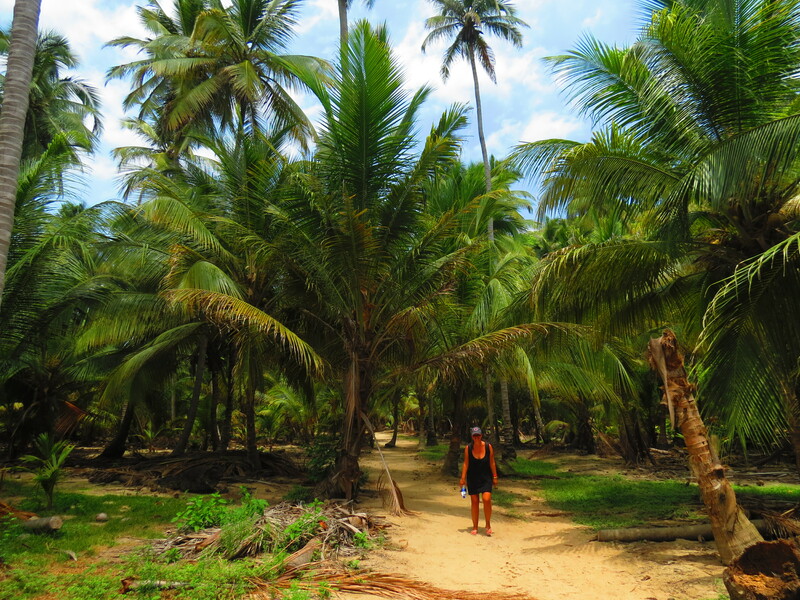 We followed the trail further into the jungle and passed several beautiful beaches on our way to Cabo San Juan, where we would be spending the night. We spent the afternoon lazing on the beach and it was wonderful…I know it’s only a few months since we were last on a beach but I have missed it so much. Our bed for the night was a hammock about 50m from the beach…sounds idyllic but the reality of sleeping in a hammock is being is a very uncomfortable night’s sleep. The evening was very relaxed…a nice meal and enough beer to help us sleep. The next day after a few more hours on the beach we followed the trail back to the entrance but this time we stopped at all the beaches along the way, had a dip and played with the frisbee. 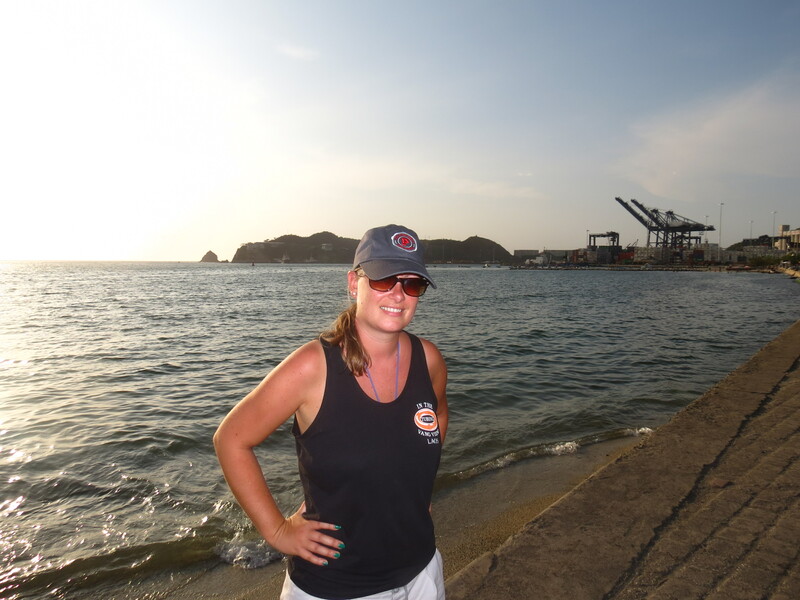 We eventually got back to Taganga around 7pm and managed to meet up with the group who had taken the boat…they all had a good time but I am so pleased we chose our route. The beaches were the nicest we’ve seen in a long time and the first we’ve seen in Colombia. I actually felt I was on the Caribbean coast. After leaving the Galapagos we had a very brief stopover in Guayaquil before taking a bus to Cuenca, about four hours away. 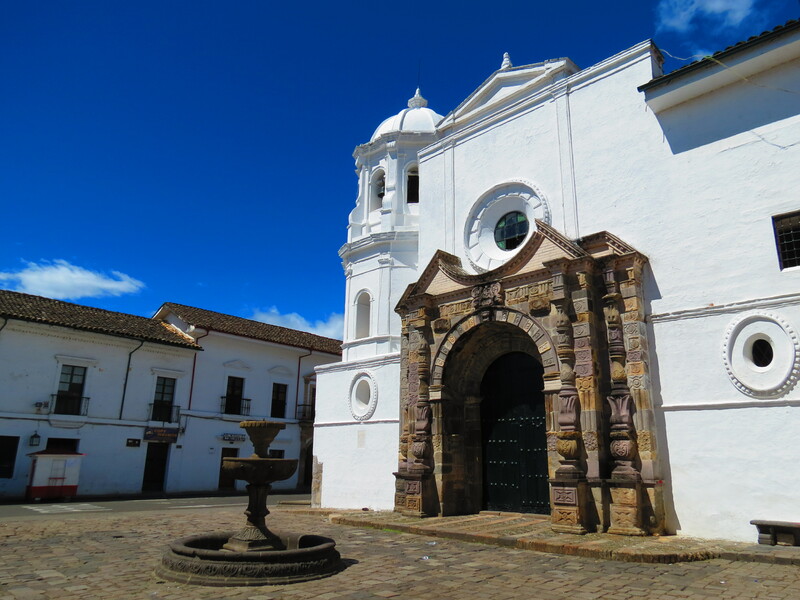 Cuenca is a lovely city in the South of Ecuador. It has a very nice climate as it is 2500m above sea level but still close to the equator. The drive here was pretty spectacular, taking us around narrow winding mountain roads just above the clouds. 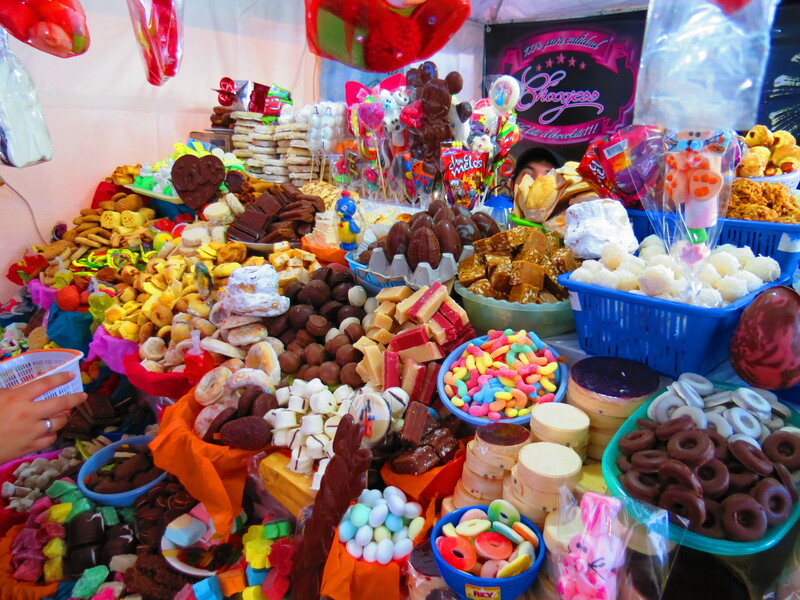 When we arrived it was midway through the festival Corpus Christi, and the streets were lined with hundreds of little stalls selling all kinds of cakes and sweets. In the evening there were fireworks and performances in the main square, so it was a nice time to be in the city.Rather than sitting around eating cake all day, the bulk of our time was taken up learning Spanish; or at least trying to. We had four hours of lessons a day over four days, which left us feeling fairly numb afterwards. At one point there was a suggestion that we do eight hours of lessons a day, but I’m very pleased that we decided against it. The title pretty much sums up the extent of our Spanish language knowledge so far. Our main aim was to learn enough Spanish to get us by in South America, but what we’ve learnt in 16 hours is just not enough. I’ve never been very good at learning languages; just test my German if you don’t believe me, but I must say that Spanish is complicated. The good news is that we have over six months remaining to try and improve, so we’ll just have to see how it goes. Our next stop was Baños via an eventful journey on a night bus. We spent most of the journey awake as the driver didn’t feel the need to slow down when going around corners. It meant that rather than snoozing away the hours, we were left holding on for our lives. We thought the night bus would be a good way to save money, but when we arrived at 4:00am it meant that we needed a room anyway. Thankfully the hostel was kind enough to let us check in very early for no extra cost. 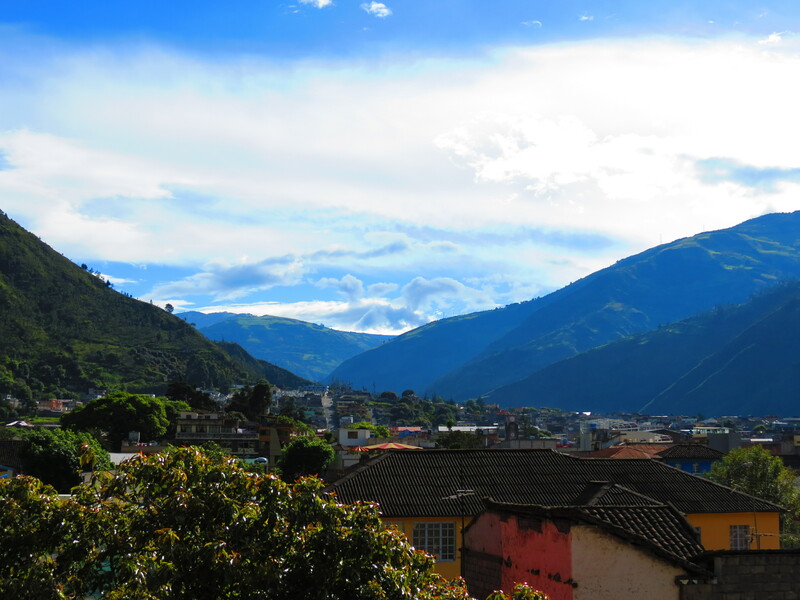 Baños is a really pretty little town in central Ecuador surrounded by mountains and waterfalls. Although it’s small, it’s a busy place with plenty of things to see and do. 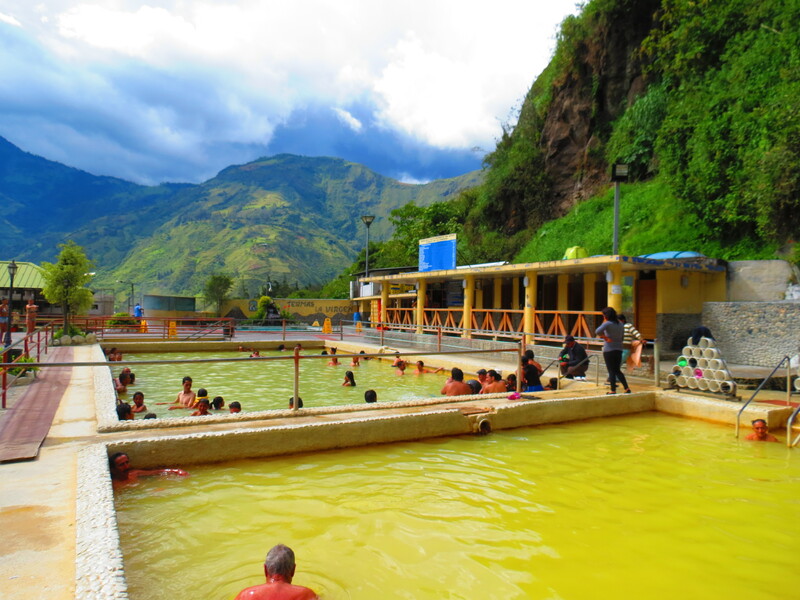 One of the most popular activities and from where the town gets its name, are the thermal baths. Just after arriving, we bumped into a guy that we had met in Cuenca. He spoke very good Spanish, so it was handy to have him as our translator. We enjoyed a couple of hours in one of the public baths, and it was quite a funny experience. There are three pools of varying temperatures from very hot to tepid, and freezing cold showers fed direct from a waterfall. The water comes out of the mountain at 60°c, and the temperature is adjusted for the different pools by adding water from the waterfall. The water looks quite murky and uninviting, but it’s because it contains various minerals…apparently. The idea is that you alternate between the showers and the pools. We spent most of our time in the hottest pool, which was so hot it was a struggle to get in to, especially after the showers. After various rotations we started to feel quite weary, as it really takes it out of you. It feels similar to a session in the gym, so we quickly left for a quick beer to let our bodies recover. 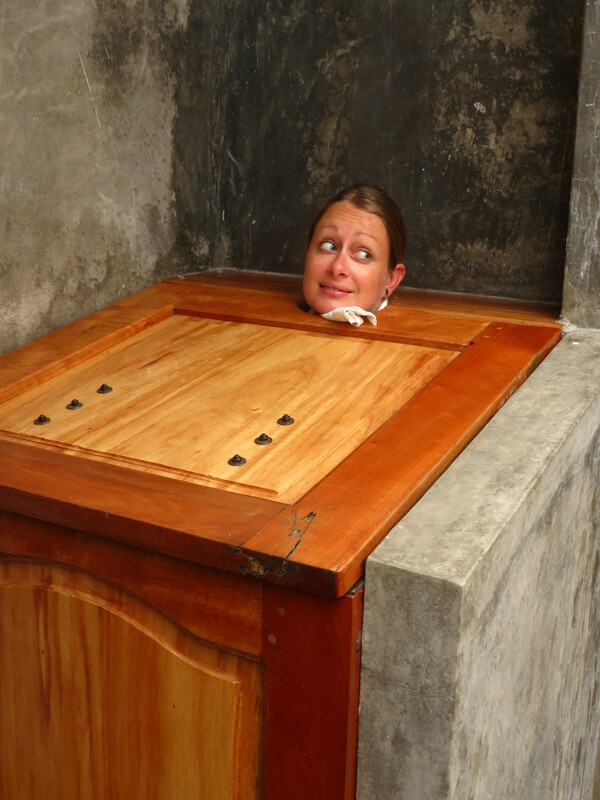 Our hostel also had steam baths which Katy decided to try. She did try and persuade me to join in, but thankfully I decided not to. Instead I was available to take photos of her experience. I think she pictured a relaxing time sat in the weird wooden boxes with the steam working its magic. Instead she was hosed down with freezing cold water every ten minutes and then asked to get back into the wooden box. Not really my idea of fun, but it was quite amusing to watch. The rest of our plans for Baños were ruined by persistent rain. We wanted to rent mountain bikes and cycle 30km (mostly downhill) to see some of the waterfalls, but it didn’t seem as attractive without the sunshine. We did manage to see some of the Euro 2012 games, although I wish he hadn’t bothered. We went out to watch the England group games in Cuenca which certainly didn’t help our Spanish lessons the following morning. In Baños we watched the game against Italy and I was left with the same feeling that I am always left with when watching England…boredom. It really was a horrendous game to watch, even with the drama of penalties. Next we decided to move onto to Puyo, a town that was recommended to us by our Spanish teacher. It’s located in Ecuador’s part of the amazon basin called El Oriente, and is a gateway for amazon trips. What he didn’t tell us is that it’s a very ugly town with very little to see and do. 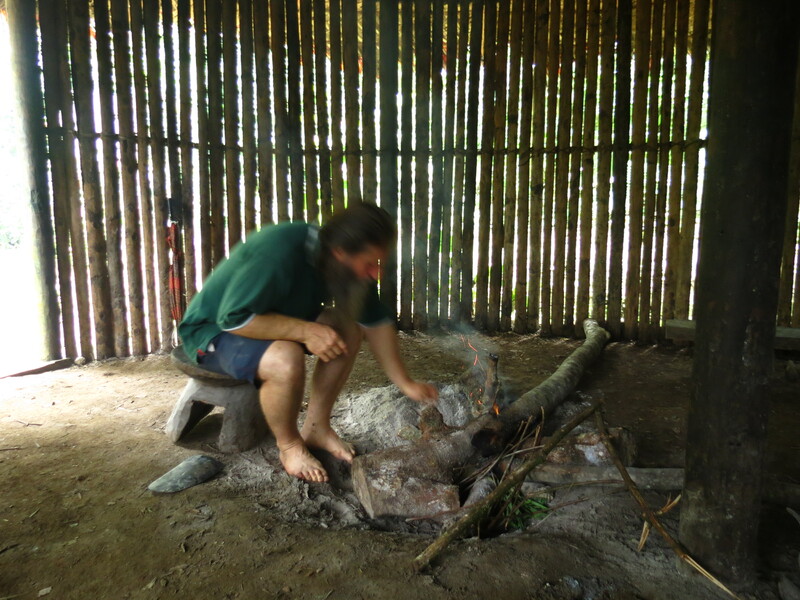 We decided to visit the Omaere Ethnobotanical Park where we were guided around an area of the jungle by Chris, an American biologist. He spoke to us about the various tribes of indigenous people and their relationship with the plants that surround them. It’s one of the only places remaining in the region that produces medicine from the jungle. You can get anything from cold and flu remedies to skin and hair tonics; even contraception. It was a really interesting tour, and a great way to learn a bit more about the local history and traditions. Next we headed north to Ibarra, not far from the Colombia border. This was another town nestled high in the Andes and eight hours from Puyo. There isn’t a huge amount to do here, but it was a convenient place to stop before heading into Colombia. Nearby is the market town of Otavalo which is surrounded by the volcanic peaks of the peaks of Imbabura, Cotacachi, and Mojanda. 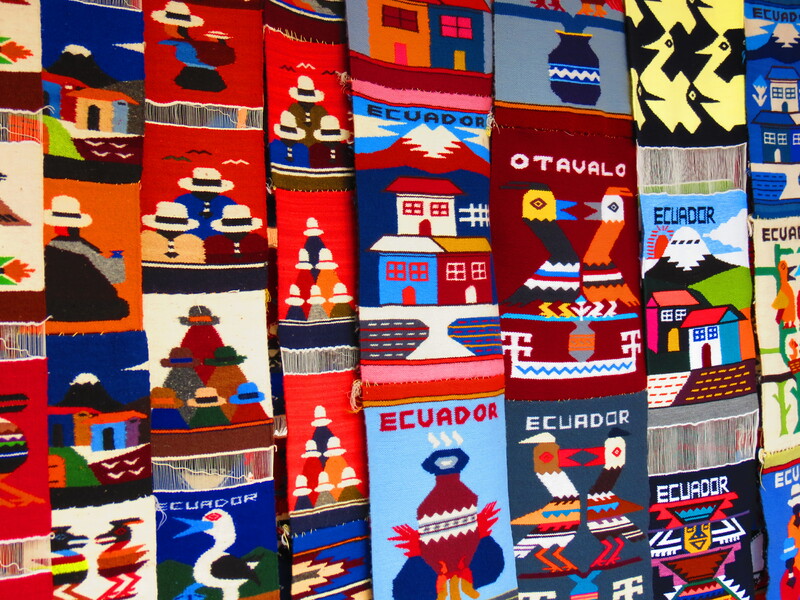 The market dates back to pre-Inca times and is the largest crafts market is South America. It is so popular within Ecuador that tourists and locals alike come to visit from all over the country. We only spent one night there on the way to Colombia and after much searching we both came away with our token alpaca jumpers. Katy also treated herself to some matching alpaca socks for those long and cold bus journeys ahead. After travelling for over nine months now, one of the things we have missed most is cooking. It may sound strange, but eating out every night can get to you. 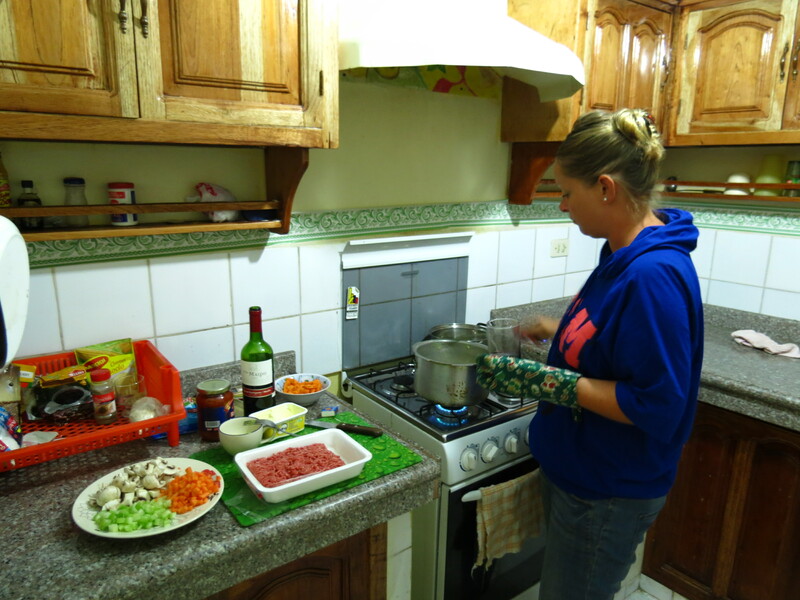 So far most of the places we have stayed in Ecuador have had a communal kitchen, so we have enjoyed making some of our own meals. It’s been good to see Katy back to doing what she does best, and we’ve also managed to find some decent cheap red wine to wash it all down. That’s not to say that the food here is bad. One of the best ways to eat is at lunchtime by sampling an almuerzo. It usually comprises of three courses of soup, a main dish and a desert, and also comes with a fruit juice shake. Half the fun is not asking what is on the menu today, so it’s a bit of a surprise. They are usually very good though, and a bargain at $2. We have however had a bad almuerzo experience. Katy decided that she liked the look of a restaurant and surprised me by ordering for us. This wasn’t your typical set lunch menu, and she told me afterwards that she had ordered the local speciality ceviche, which she thought was marinated raw fish. We had skipped breakfast that morning so this wasn’t really what I was in the mood for. What came out of the kitchen was worse than I expected. The only way I can describe it is raw mussels and squid (I think) in a cold soup that tasted more like a salad dressing. It was a struggle to eat it, and Katy refused to even try the fish. We were also shocked when the bill came to almost $20. 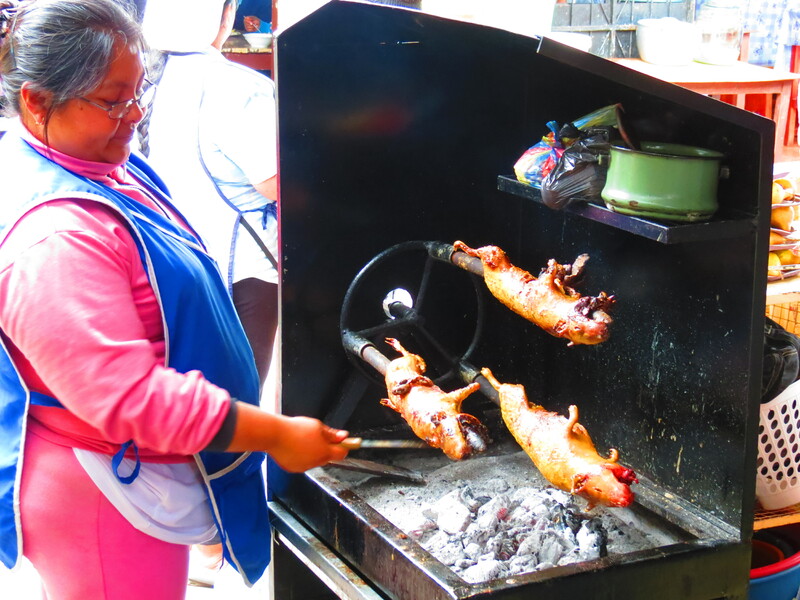 Another local speciality is Cuy, or Guinea Pig. I have been desperate to try this, but whenever we’ve wanted it we either can’t find it or the restaurants have been closed. It’s normally barbequed or roasted whole and served spatchcocked with beans, rice, potatoes and a sugarcane alcoholic drink. I’m hoping we will be able to try it before we leave Ecuador because I am intrigued to know what it’s like. 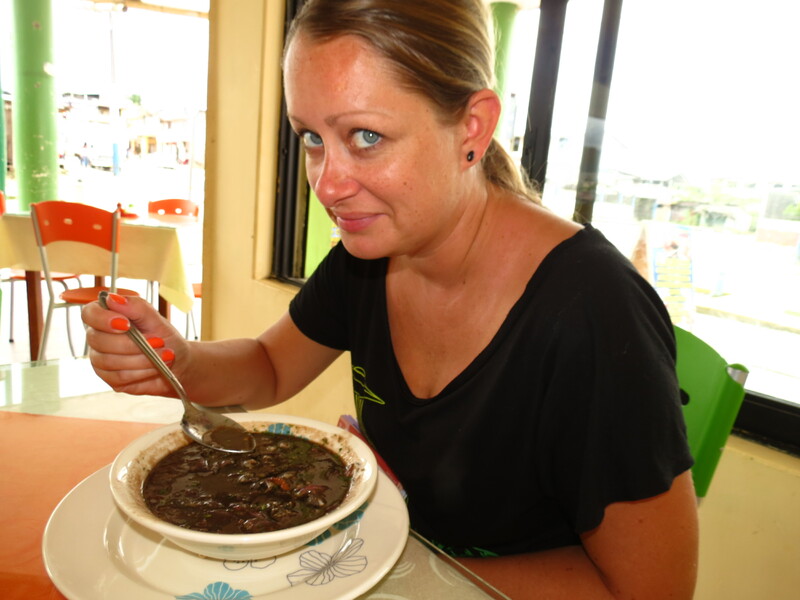 Although the food in Ecuador is good, it’s not very healthy. Everything seems to be deep fried or very sweet. I came to South America expecting to see lots of good looking Hispanic women, but most of the younger women seem to be bulging out of their leggings (in more ways than one). It’s almost like being back in East London.